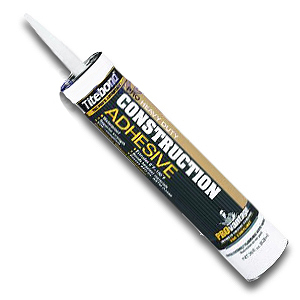 PRODUCT: PRO Heavy Duty Construction Adhesive, by Provantage Titebond . High-Performance, 74% Solids, Brown Color, 28 Oz Tubes. 12 Tubes/Case. Price/CASE. DESCRIPTION: Heavy Duty construction adhesive high performance adhesive. It is ideal for bonding most common materials including wood, metal, brick, marble, ceramic tile, concrete, drywall and wet, frozen and treated lumber.